Back in March Nachum Segal held his annual fundraiser for JM in the AM which airs daily from 6am-9am on WFMU. Various gifts were sent to people who sent it donations. For a donation of $90 or more, the givers received a copy of JM in the AM’s Live 2012 CD, featuring performances recorded live on the program. Until now we haven’t disclosed who was featured on that CD, but the time has come to tell all. 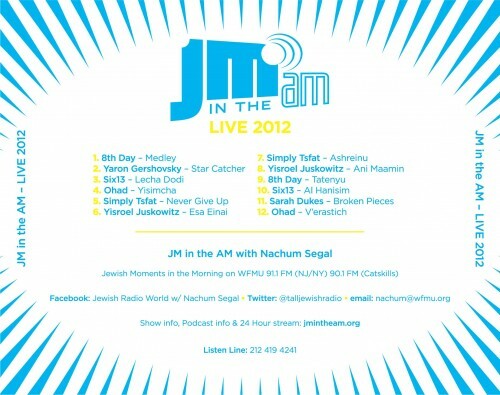 The JM in the AM’s Live 2012 CD includes performances by; 8th Day, Ohad, Six13, Simply Tsfat, Yaron Gershovsky, Sarah Dukes and Yisroel Juskowitz. If you donated $90 or more back in March then you will receive the CD, if NOT then you can donate anytime and get this amazing collection of LIVE performances by visiting www.jmintheam.org and hitting the donate now button.